Former Mount Sterling village administrator Joe Johnson glimpses at his family in attendance during his arraignment in Madison County Common Pleas Court on Wednesday. He is being held on a $500,000 bond. Authorities raided this Washington Court House apartment on Thursday and seized several items allegedly purchased by dormer Mount Sterling village administrator Joe Johnson with village money. Items included a car, furniture, washer and dryer, TV and documents. Authorities raided a Washington Court House apartment Thursday morning, seizing items allegedly purchased by former Mount Sterling village administrator Joe Johnson with village money. 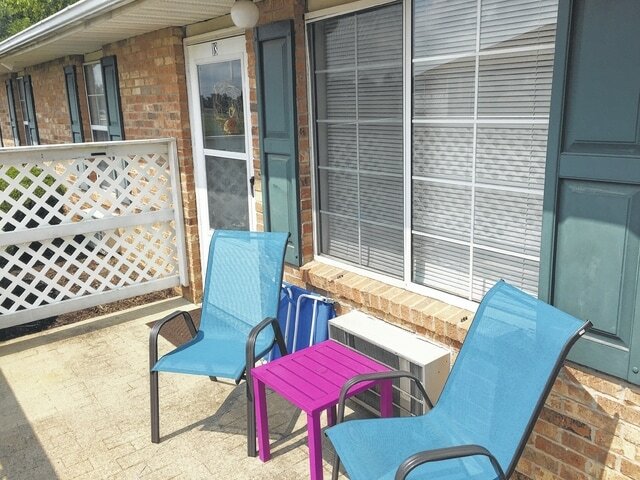 The one-bedroom apartment, located at 18 Residence Drive, belongs to Madison Newsome, according to Madison County Sheriff Jim Sabin. He and four deputies — as well as Fayette County deputies and representatives from the Ohio Auditor of State — arrived at the residence at 7:30 a.m. They seized several items, most notably, a 2013 Chevrolet Cruz, titled in Newsome’s name, which Johnson allegedly bought in March 2015 from Nourse Auto Mall for $14,800. Newsome was named in a 30-count indictment against Johnson, returned by the Madison County grand jury July 13. The search warrant says Johnson used village money to buy a vehicle for a former female co-worker. Newsome worked as a clerk in village hall for about one year, said Sabin. Other items picked up include a dining room set, living room set, flat-screen television, documents and a washer and dryer. Police looked for two sets of washers and dryers when they raided Johnson’s Jackson County home last week, but only found one. The other was found at Newsome’s apartment Thursday. Johnson, 46, is charged with theft in office, theft, money laundering, tampering with records, failing to file personal income taxes and engaging in a pattern of corrupt activity. He is accused of stealing at least $600,000 in village funds between 2012 and 2016. The case remains under investigation and additional arrests are possible. The corrupt activity charge is a first-degree felony that could put Johnson in prison for 11 years. Johnson remains in at Tri-County Jail under $500,000 cash or surety bond. If the former administrator manages to post bond, he will be under house arrest at his 3203 Camba Road home near Jackson. The case remains under investigation by the state auditor. Additional arrests are possible.